Yesterday Joachim Boaz of SF Ruminations tweeted a link to a review of Harry Harrison’s Deathworld at Speculition which is well worth any SF fan’s time. I thought this was as good an occasion as any to record my thoughts about Harrison. I read the first three Deathworld books in my youth in an omnibus edition from the library. As a kid I loved the idea of a planet where you have to shoot everything that moved. I guess because my mother was a smoker and because there was a lot of anti-smoking propaganda at school, I’ve never forgotten the argument at the start of Deathworld 2 in which we learn that tobacco in the future will have no carcinogens and Harrison has the hero argue that the villain, who is against smoking, is a puritanical hypocrite. I read the first three Deathworld books again as an adult, over a period of years, by chance in reverse order. I enjoyed them all, but I remember nothing about Deathworld 3, and sold my copy at some point. My review of Deathworld 2 has survived on Amazon, and is pasted below. I still have my copy of Deathworld 2 because I love the cover. A pretty good and fast-paced adventure tale, I suppose you could call it a planetary romance; a spacefaring thief is shipwrecked on a planet inhabited by various barbaric/medieval tribes. In his efforts to get back to interplanetary society, Harrison's smartass hero plays the part of a Connecticut Yankee in King Arthur's Court, introducing various pieces of technology to the primitive world. The novel is enlivened (some might say encumbered) by Harrison's attacks on religion and advocacy of moral relativism. Deathworld 2 is no masterpiece, but is definitely fun if you take it in the right spirit. I read the September 1964 Bantam paperback with the beautifully sinister brown painting on the cover and the ad for Winston Churchill's The Second World War on the last page. 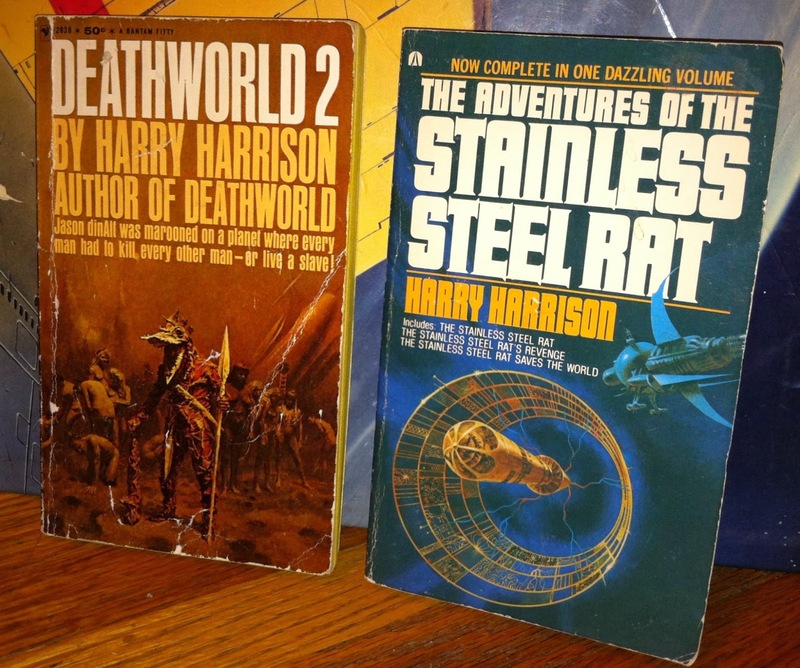 I read the first four or five Stainless Steel Rat books in my teens, but only remember the first three, which I read in a thick hardcover omnibus from the library, with any fondness. I recall that, with each new book, the jokes become more and more broad and the social/political commentary more obnoxious. I have a paperback collection of those first three books now, and have reread the first as an adult. I enjoyed it as a fast paced adventure story, but probably not enough to read the other two books in the collection. I loved the broad absurdist satire of Bill the Galactic Hero when I read it. I won’t read it now, as I expect I would find it irritating. The book is a parody of Heinlein’s Starship Troopers (while Heinlein found his time in the Navy a positive experience, service in the Army Air Force fostered in Harrison a hatred of the military) and an anti-military and pro-environmentalism satire. I think I read Bill the Galactic Hero before I read Starship Troopers, oddly enough. Bill loses an arm while serving in a war against innocent aliens who are victims of human aggression, and the inefficient military bureaucracy has a replacement arm grafted on, but not only is it a different skin color from his own, it is a left arm – it was a right arm that Bill lost, so now Bill has two left arms. I also recall scenes about how some planet is making too many dinner trays that are not biodegradable, so the planet is being overrun with dinner tray filled landfills. As a youth I loved crazy stuff like this, but now this sort of thing seems tired and annoying – I feel the same way about Monty Python, which, when I was young, I adored. I tried to read one of the Bill sequels, written over 20 years after the first, but it was horrible and I was older and I quickly abandoned it. If my memory is to be trusted, these books are more serious and less polemical than the other Harrison books I read. They depict an alternate Earth in which, while humans developed in one part of the world, lizard people developed in another. The plot of the books concerns the resistance of Stone Age humans to efforts by the lizard people to colonize the human territory. It was in these books that I first encountered the idea of organic technology: instead of making a gun or a boat out of wood, metal, plastic, gasoline, gunpowder, etc., the reptile men (somehow) bred a small lizard which could expel darts out of a sphincter for use as a gun, and bred a big aquatic animal to act as a ship. I also enjoyed the many illustrations in the paperback editions of these books of the cool lizard people and their weird living equipment. I would definitely try rereading the first of these, West of Eden. UPDATE: In the last week of December 2013 I read West of Eden, and quite enjoyed it. I haven’t read any of Harrison’s later work, and it doesn’t look very interesting (alternate history Vikings and alternate history British intervention in the U.S. Civil War aren’t doing it for me.) But I enjoyed and can recommend much of Harrison’s earlier work, and have to commend Harrison on his exciting and fruitful career, which included lots of editorial work, moving to Ireland to escape taxes, the quixotic advocacy of Esperanto, and collaborations with one of the best comics artists, Wallace Wood. That's a full life, and we SF fans are richer for it. Thanks to Joachim, I've just discovered your blog, and look forward to seeing more posts form you in the future. I too once posted only on Amazon, but dislike for the format eventually took over, and I shifted to blogger. I hope you find the enhanced freedom as invigorating. I'm a big fan of Harry Harrison. 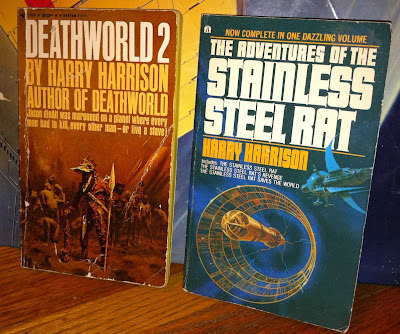 My first non-Star Wars SF reading experiences as a kid were in the Stainless Steel Rat book you have pictured. I fell so deeply for it and re-read it so often that it truly remains one of my favorite reading experiences and I still very much enjoy it now that I am in my mid 40's. A decade or so ago I read this volume aloud to my wife and she thoroughly enjoyed it as well. It isn't without its problems, as you point out, but I haven't outgrown it. Not too many years back I read the Deathworld books and enjoyed them all as well. I never could get into the Bill books. After falling so hard for Slippery Jim DiGriz, Bill was just too silly for me. Had it been written by another author I probably would have enjoyed it, but I was so stuck on that kind of writing from Harrison that I couldn't go with him into his Bill stories. Have you read the Eden books? I'm thinking of reading them in the near future. I recently bought the second and third of the trilogy at a library book sale, now I just need to find the first. I haven't, nor have I read the To the Stars trilogy which I have had multiple copies of for years.